Sometimes great things come from inauspicious beginnings. The Adventurers, a 1970 film directed by Lewis Gilbert, based on a Harold Robbins potboiler, is an agglomeration of every imaginable stereotype of brutal, exotic Latin America. Although the film is loosely based on events in the Dominican Republic, it is set in Cortoguay, a fictional country where the ragged campesino rebellion of the Mexican Revolution, the tropical splendor of Brazil and the interiors of a Poconos love motel clash in agony and ecstasy for three incoherent hours. But the film has one saving grace: the brilliant soundtrack composed by Tom Jobim, orchestrated by Brazilian arranger Eumir Deodato. The Adventurers’ soundtrack served as the basis for Stone Flower, a Jobim studio album also released in 1970, again with arrangements by Deodato. Stone Flower reunited Jobim with Creed Taylor, producer of Getz/Gilberto, as well as Jobim’s acclaimed 1967 album Wave. Like Wave, Stone Flower was recorded at Rudy van Gelder’s Englewood Cliffs studio, and has the warm, but spacious sound characteristic of Taylor’s productions and van Gelder’s engineering. Stone Flower is one of Jobim’s great albums—a masterpiece of innovative material, brilliant performance and flawless production. But it remains little known, both in Brazil and internationally. Granted, Stone Flower lacks a crossover hit like “The Girl from Ipanema” and could not be expected to achieve the iconic status of Getz/Gilberto. But Stone Flower is a more consistent album than Wave, yet attracted far less attention among Brazilian jazz enthusiasts. The advantage of a stone flower, however is that it does not wilt, and this one deserves renewed appreciation. Jobim’s score for The Adventurers includes two of his greatest songs, both included on Stone Flower in more extended format, with new arrangements. The first, listed as “Children’s Games,” was later given lyrics in Portuguese by Jobim himself and retitled as “Chovendo na Roseira,” (Raining in the Rose Garden). It was ultimately given a new set of English lyrics by Gene Lees, and retitled in English as “Double Rainbow.” The second is listed as “Amparo” in the soundtrack, and became better known as “Olha Maria,” with lyrics in Portuguese by Vinícius de Moraes and Chico Buarque. Both are classic Jobim: unforgettable melodies set against subtle harmonies. They are unusual in Jobim’s catalogue in that both are in 3/4 time. This takes Jobim away from the 2/4 time signature common to choro, samba and bossa nova. But is not a radical departure—waltzes were central to both erudite and popular music in Rio de Janeiro since the nineteenth-century. Jobim’s compositions in 3/4 time are rooted in Brazilian tradition, informed by jazz and French impressionist music, and unmistakably his own. “Children’s Games/Chovendo na Roseira” is one of his most intricate compositions, in its unusual structure, in its syncopated rhythms, and particularly in the subtlety of its harmony. It owes more to Debussy than to any jazz influence. The song is like a pocket symphony in sixty-two measures, divided into three sections, with chromatic voicings deep in the harmony of the first section surfacing more prominently in the third section. The melody, true to the theme of children’s games, skips nimbly over this unusual harmony, belying its complexity. “Amparo/Olha Maria” is one of his most haunting love songs. Both are given gorgeous treatment by an ensemble that brings Brazilian instrumentalists together with US jazz musicians. Airto Moreira and Everaldo Ferreira on percussion and João Palma on drums, together with Jobim on piano and keyboard and Deodato on guitar, form the Brazilian contingent. Ron Carter on bass, Joe Farrell on Sax, Hubert Laws on flute, Urbie Green on trombone, and Harry Lookofsky on violin bring the jazz influence. In Deodato’s hands, however the result is not Brazilian jazz, but orchestral, with Brazilian and jazz tonalities. This treatment succeeds in part because of the musicianship, in part because of the consistency of the material, which varies widely in mood and rhythm but remains coherent. All the compositions are Jobim’s with the exception of a rendition of the Ary Barroso classic “Aquarela do Brasil” with vocals by Jobim himself. 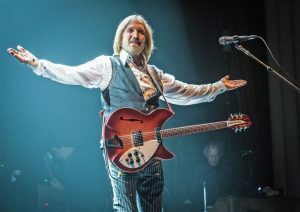 In addition to “Children’s Games/Chovendo na Roseira” and “Amparo/Olha Maria,” the standouts include the title track (“Stone Flower”) and “God and the Devil in the Land of the Sun”. Both are brooding, intense refrains relying on the rhythms of northeastern Brazil for their insistent drive. So why didn’t Stone Flower achieve the same fame as Wave (much less the universal recognition of Getz/Gilberto)? It has something to do with timing—the Brazilian sound was still hip for jazz cats in 1967, when Wave came out. By 1970, the U.S. jazz audience had fractured into smaller segments, making it more difficult to attract a sizable audience for any venture—and the orchestral Brazilian sounds of Stone Flower, bewitching as they are, did not appeal broadly. But I think it is primarily a question of cover art. Getz/Gilberto, in addition to its many musical virtues, had the stunning cover art of Olga Albizu’s painting “Alla Africa” set boldly on a black background. Wave had a striking cover design by Sam Antupit featuring a Pete Turner photograph of a giraffe standing in shallow water, set against a starkly monochromatic background—emerald in some printings, scarlet in others. (The giraffe was inexplicable, as giraffes inherently are.) The cover of Stone Flower, in contrast, shows Jobim in profile, wearing a blazer, pressed shirt and tie, smoking a cigarette. He looks like a character from the nightclub scene of The Adventurers. The cover is stuck in the same world as the film. The music transcends that origin, and brilliantly endures. 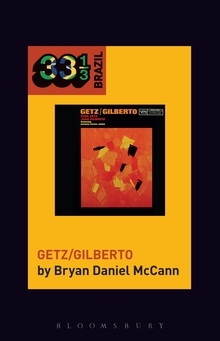 João Gilberto and Stan Getz’s Getz/Gilberto is out today. Get your copy at up to 45% off in our holiday sale, where all published 33 1/3s are on offer too.